Ripley Clauss NO-NIK Fiber Optic Strippers White 305um/.012"
Home > Tools and Supplies > Cut&Strip > Ripley Clauss NO-NIK Fiber Optic Strippers White 305um/.012"
Price: Call Now for Special Pricing! 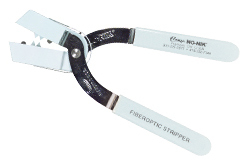 No-Nik Fiber Optic Strippers meet the most stringent specifications. Used properly they are 100% reliable. Plastic heads, which make contact only with the Buffer, center and support your work on both sides. Cutting blades made from razor quality steel score the Buffer completely. Back-up blades support the cutting blades, nest positively, and "lock up" when the tool is closed to maintain perfect concentricity. Buffer being removed acts as guide and protecton for the fiber. © 2019 GCITechSource.com E-Commerce Web Site, All Rights Reserved.